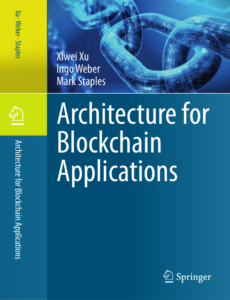 This page is about our technical research on blockchain. See this page for our reports on how blockchain technology could be used across government and industry in Australia to deliver productivity benefits and drive local innovation. Blockchain is an emerging technology for decentralized and transactional data sharing across a large network of untrusted participants. 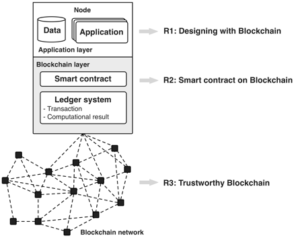 It enables new forms of distributed systems, where participants can find agreements on their shared states without trusting a central authority or any particular participates. Our group is mainly working on three directions, including designing with blockchain, analyzing and improving trustworthy of blockchain, and legal reasoning with Smart contracts on blockchain. How do machine learning, robotic process automation and blockchains affect the human factor in business process management? Communications of the Association for Information Systems (CAIS). Peer-reviewed panel paper. ACM Transactions on Management Information Systems (TMIS), 9(1):4:1-4:16. Peer-reviewed research commentary. February 2018. 2018 7th ACM SIGPLAN International Conference on Certified Programs and Proofs, Los Angeles, USA, January 2018. Ingo Weber, Vincent Gramoli, Mark Staples, Alex Ponomarev, Ralph Holz, An Binh Tran and Paul Rimba. 2017 IEEE International Symposium on Reliable Distributed Systems (SRDS’17), Hong Kong, China, September 2017. Luciano García-Bañuelos, Alexander Ponomarev, Marlon Dumas, and Ingo Weber. 15th International Conference on Business Process Management (BPM’17), Barcelona, Spain, September 2017. Orlenys López-Pintado, Luciano García-Bañuelos, Marlon Dumas, and Ingo Weber. 15th International Conference on Business Process Management (BPM’17), Demo track, Barcelona, Spain, September 2017. Mark Staples, Shiping Chen, Sara Falamaki, Alex Ponomarev, Paul Rimba, An Binh Tran, Ingo Weber, Xiwei Xu, and Zhenjiang Zhu. Technical report, Data61, CSIRO, Sydney, Australia, June 2017. An Binh Tran, Xiwei Xu, Ingo Weber, Mark Staples and Paul Rimba. 29th International Conference on Advanced Information Systems Engineering (CAISE’17). Xiao Liang Yu, Xiwei Xu and Bin Liu. Christopher Natoli and Vincent Gramoli. 2017 IEEE/IFIP International Conference on Dependable Systems and Networks (DSN’17). Tyler Crain, Vincent Gramoli, Michel Raynal, Mikel Larrea. Xiwei Xu, Ingo Weber, Mark Staples, Liming Zhu, Jan Bosch, Len Bass, Cesare Pautasso and Paul Rimba. 2017 IEEE International Conference on Software Architecture (ICSA’17), Gothenburg, Sweden, April 2017. Paul Rimba, An Binh Tran, Ingo Weber, Mark Staples, Alexander Ponomarev and Xiwei Xu. Short paper, 2017 IEEE International Conference on Software Architecture (ICSA’17), Gothenburg, Sweden, April 2017. Rajitha Yasaweerasinghelage, Mark Staples and Ingo Weber. Idelberg, Florian and Governatori, Guido and Riveret, Regis and Sartor, Giovanni. Luke Anderson, Ralph Holz, Alexander Ponomarev, Paul Rimba, Ingo Weber. Ingo Weber, Sherry Xu, Regis Riveret, Guido Governatori, Alexander Ponomarev and Jan Mendling. Sherry Xu, Cesare Pautasso, Liming Zhu, Vincent Gramoli, Alexander Ponomarev, An Binh Tran and Shiping Chen.